Aircraft carriers are by definition huge. Really huge. Since their creations, this type of vessel has played a vital role in the United States’ defense, and have left an impact around the world. With the passage of time and every technological advancement, these ships have gotten better but understandably bigger. These ships use a rudder, which is a primary control surface used to steer a ship, boat, submarine, hovercraft, aircraft, or other conveyance that moves through a fluid medium (generally air or water). Because of the uncertain nature of war itself, and any possible situation that on which ships may need to turn or change directions, something called a rudder test was created, to check the rudder swing in port and starboard directions, its maximum movement. 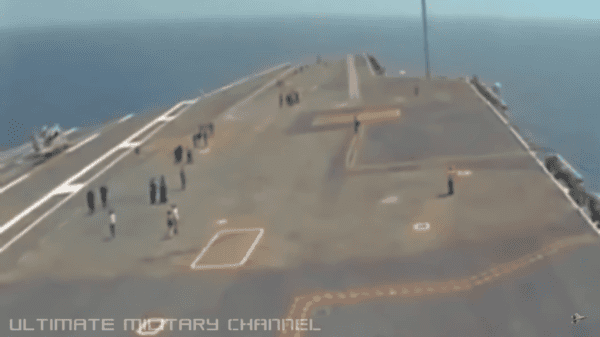 To do this with a small vessel should not be a real issue, but when it comes to a giant such a Nimitz-class aircraft carrier, the story is completely different. 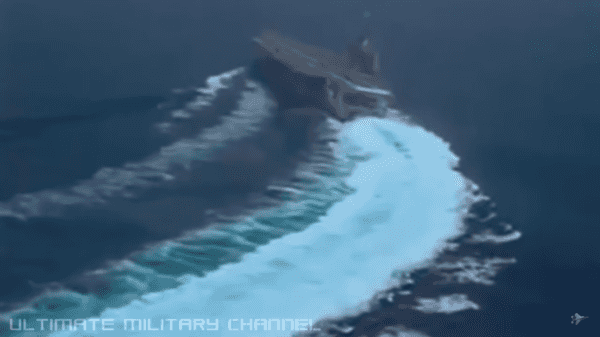 This extraordinarily rare vision of an aircraft carrier conducting this type of action was captured during sea trials to train sailors and to ensure the operational capability of systems and equipment. It’s not much compared to small ships, but huge for a carrier. There are ten Nimitz-class aircraft carriers in the service of the United States Navy with the first being the USS Nimitz, named after World War II United States Pacific Fleet commander Fleet Admiral Chester W. Nimitz, the U.S. Navy’s last fleet admiral. The USS Nimitz was commissioned on May 13, 1975 and the USS George H.W. Bush, the tenth and final ship of its class, was commissioned on January 10, 2009. The unit cost of the aircraft carrier is roughly $8.86 billion as of 2016. Nimitz-class supercarriers have participated in multiple conflicts all over the world and operated in many different parts of the world, including during the Gulf War, and in Iraq and Afghanistan. Nimitz-class carriers have an overall length of 1,092 ft and were ordered to replace the Kitty Hawk-class carriers and the Enterprise-class carriers after they were decommissioned. Nimitz-class carriers were designed to have a 50-year service life and are replaced after decommissioning. The cost for the decommissioning of the Nimitz-class carriers is between $750 million and $900 million as opposed to the $53 million cost for a conventionally powered carrier. The disparity in cost is due to the deactivation of the nuclear power plants and safe removal of radioactive material and other contaminated equipment. Gerald R. Ford-class aircraft carriers are expected to replace older vessels after they are decommissioned.